Lots of experts, real estate agents and bloggers have compared the Canadian real estate market to the housing bubble in the United States. While there are some differences and many similarities, one thing is certain: the Canadian housing market will not follow the exact path of the American housing crash. Instead of comparing the Canadian housing bubble to the American one, I want to try something different. I want to compare the Canadian real estate market to something that is definitively not a housing bubble! Would you like to see a country that has never experienced a housing bubble? Below is a graph that shows real home price indices from 1970 through 2011 in both Germany and Canada. 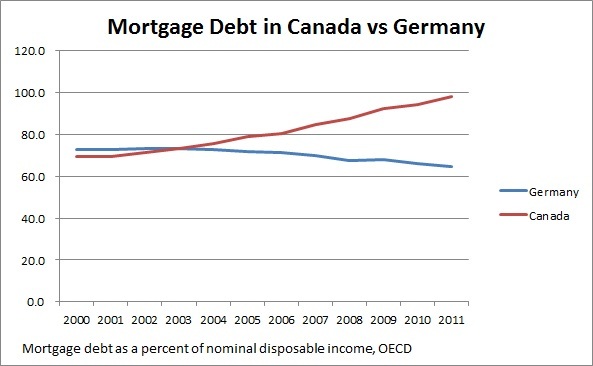 Clearly there is no housing bubble in Germany. Between 2000 and 2011 real home prices in Canada went up by 90% while home prices in Germany went down by -11%. 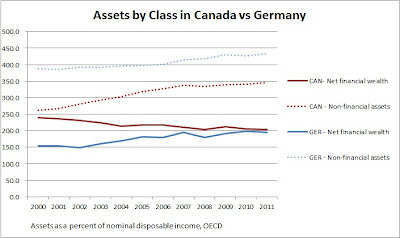 Well, there are three important differences between Germany and Canada. And there is a catch! 1. Germany has unrestricted land regulations. Everyone in Germany has a right to build on their property as long as there is no explicit law that forbids it. Also, there are no restrictive land policies such as a greenbelt. Municipalities have huge financial incentives to provide land for development of new homes. 2. Government keeps a close eye on the rental market as over 50% of Germans rent. Most of the rental units are private but because they are strictly regulated, Germans never experience sharp increases in rental costs. Furthermore, renters can enjoy a safe tenure as long as they pay their rent on time and behave adequately. 3. Availability of credit is limited. In fact, in most cases you would have to provide a 40% down payment. The maximum loan-to-value in Germany is 80%, in other words that's a down payment of 20%, but in order to secure it banks usually charge a premium interest rate. You can read more on the points discussed above here. 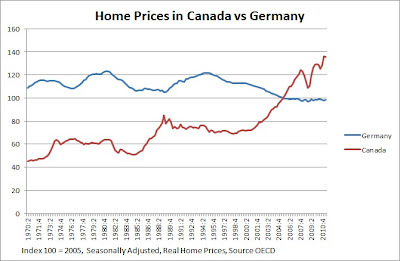 Over the past decade housing was getting more affordable in Germany while the opposite was true in Canada. 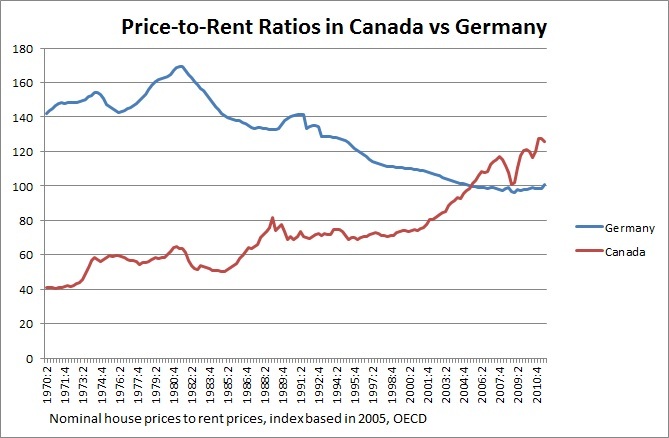 The price-to-rent ratio was increasing in Canada while decreasing in Germany. 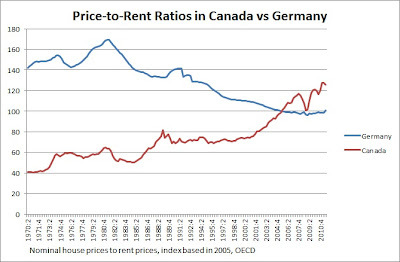 The lower the price-to-rent ratio, the more incentive there is to buy a place - yet Germans just wouldn't do it. Now that's a culture difference! Would you agree that for the most part, the early 2000's were boom years? So what did Canadians do during those years of economy growth? They got indebted like never before, while Germans were paying off their debts. Simply stunning! 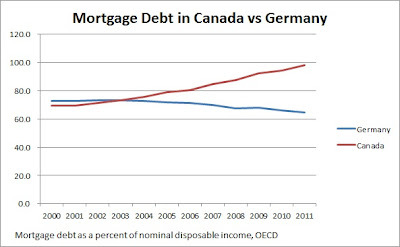 Considering the previous household debt chart, it is not surprising that mortgage debt was increasing in Canada while decreasing in Germany. Remember that there is almost a perfect correlation between mortgage debt growth and home price growth. But Canadian net-worth is currently at record levels, right? So is German net-worth! 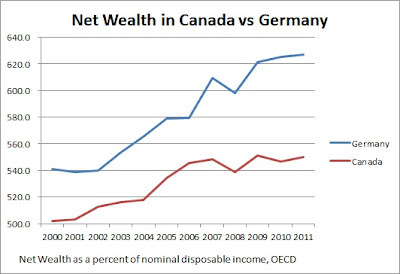 In fact, German net wealth increased 16% between 2000 and 2011, while Canadian net wealth increased only by 10%. Now here comes the bummer. 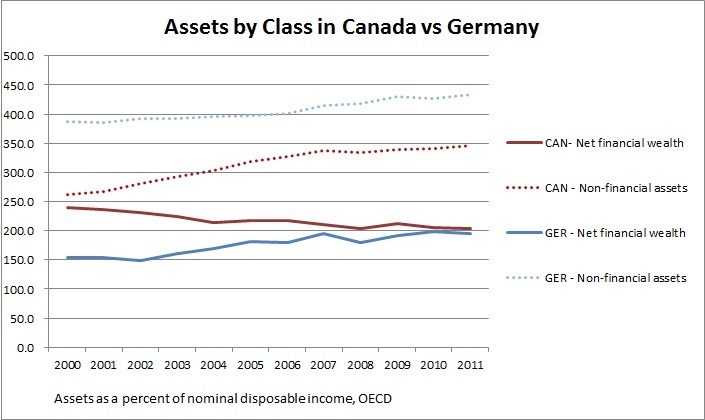 You see, for the past decade Canadian net financial assets (stocks, bonds) were in decline. At the same time, non-financial assets (such as real estate) were the only asset type that was growing. Garth was right, having most of your wealth stored in an illiquid, molding place such as your house is kinda foolish! 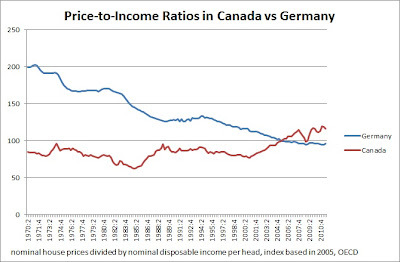 Imagine what declining house prices would do to Canadian net wealth. The population in Germany is barely growing (if at all), while Canada is enjoying a more or less stable 1% annual growth in its population. 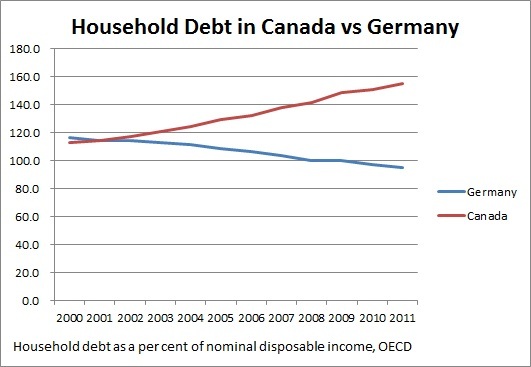 You are probably thinking: "Duh, no wonder housing prices are declining in Germany when their population is falling. 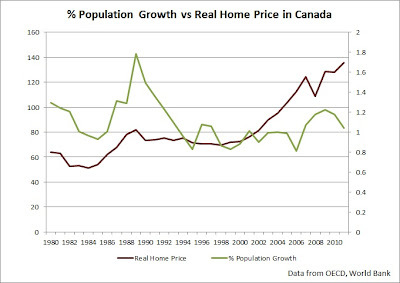 All the housing price growth in Canada is justified by the growing population!" 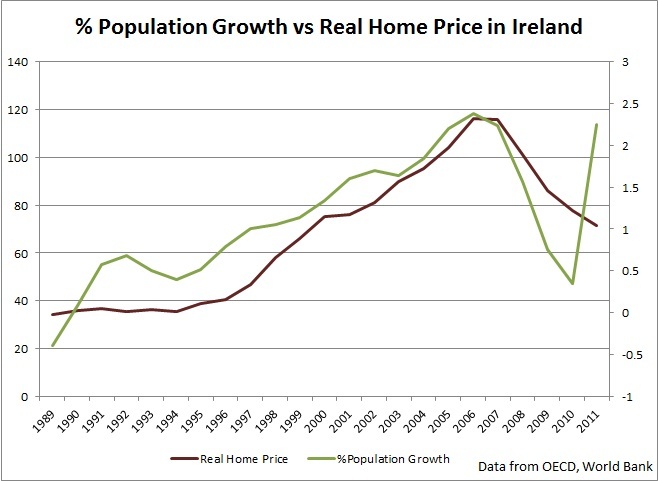 "...a sharp increase in population, which equals a steep rise in demand, is necessary to cause house prices to extensively exceed fundamental values and create housing bubbles"
The above quote is from the master thesis "Does Population Growth Affect Housing Bubbles?" by Merete Myrmo. To put this in perspective, think of the American cities that experienced the greatest population growth and the largest housing bubbles - such as Las Vegas, Phoenix, and Los Angeles. Furthermore, Myrmo notes in his paper that favorable housing regulations (think 5% down) and expansionary monetary policy (low interest rates) further increase a risk of development of a housing bubble. Below I have created charts to demonstrate Myrmo's point. 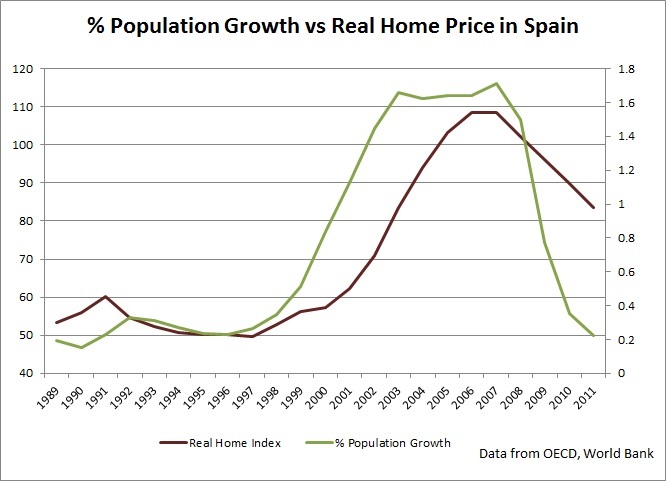 Notice the steep increases in the population growth in both Spain and Ireland. 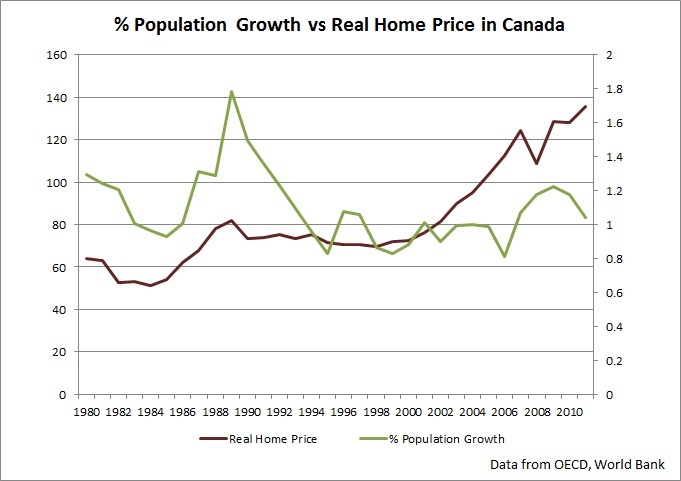 Below is the population growth vs real home price index for Canada. Notice the population growth spike during the late '80s. 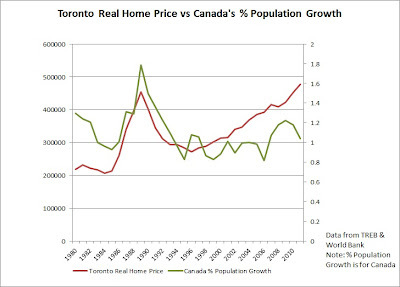 That's when Toronto's housing bubble of 1989 had burst. The only other noticeable spike is in 2005. 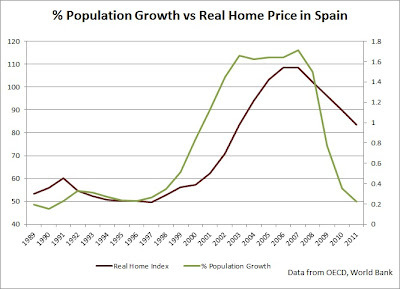 It should not be surprising that the 2005 population growth spike is tiny compared to the pattern that is evident in both Ireland and Spain as the Canadian housing bubble is much smaller than the bubbles of those two countries. 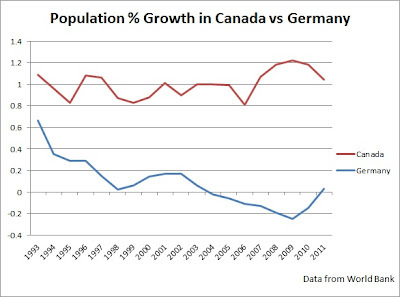 I was unable to find yearly population data for Toronto CMA, so I have used Canada's population growth for the graph below. I am warning you that I am not 100% certain that Toronto followed the same population growth pattern, but I would imagine that Toronto did since many immigrants settle in the GTA. Based on Myrmo's work, one can classify Toronto and Vancouver into a category of cities with rapidly rising populations. 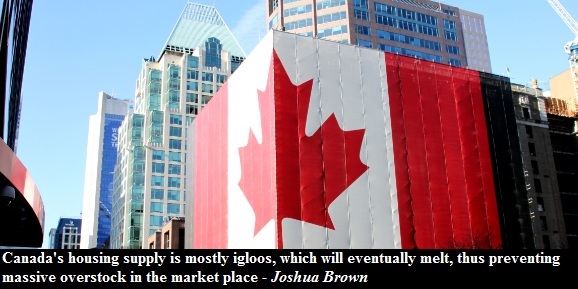 For instance, the population in the GTA and Vancouver grew by over 17% in the past decade. 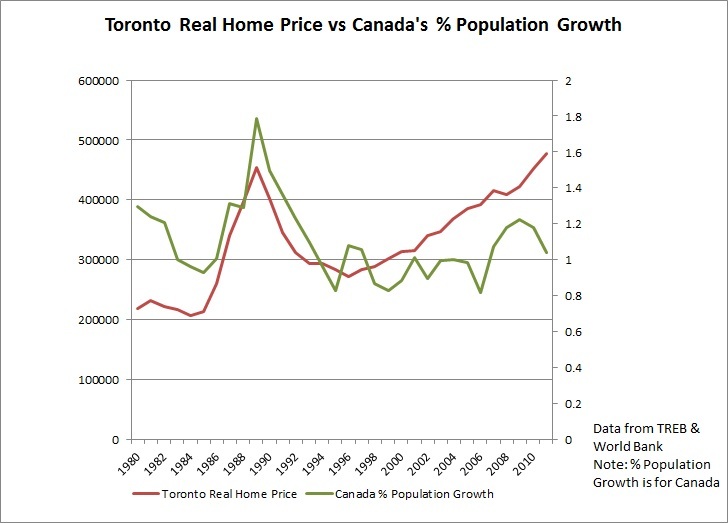 Thus, based on Myrmo's framework, one can conclude that places that experience large population growth, such as Toronto and Vancouver, are more susceptible to a formation of a housing bubble. In the case of Germany, which clearly does not have a housing bubble, only one risk factor applies, which is record low interest rates. 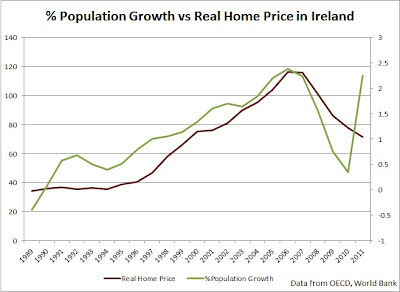 Population growth is more or less absent and it is tough to call 20% to 40% down payments favorable housing regulation. On the other hand, Canada can thank the second and third risk factors for helping it achieve its first national housing bubble. Places like Toronto and Vancouver can thank all three factors for helping both cities to form their newest housing bubbles. Why Prices are going Up when sales are going Down?